If the ‘Devo Manc’ experiment is to work, local leaders and the staff who deliver services must be given the power and flexibility to innovate, says Su Maddock. Many are sceptical about devolution, yet city leaders are confident that with greater control and freedoms they can improve their cities and local economies. The Core Cities Devolution Declaration states that by working with government they can ‘Rebalance, Reform and Renew Britain’. This is not a pipedream and is already happening in the Core Cities Group and in many smaller cities. All eyes now are on the Manchester Consortium’s strategy for improving health and social care, with a £6 billion devolved budget. Greater Manchester’s political leaders are confident they can put in place an integrated and seamless service and make savings through more innovative personal services that improve health and well being. Northern cities have embraced devolution as a route to greater control. This is unsurprising as the UK has one of the most centralised governments in Europe – and this centralisation is associated with widening inequalities and under-performance in many cities, particularly in Northern England. City leaders also welcome devolution as a way of raising finance and to inject local strategies with social values. Devo Manc is not just about business and infrastructure investment, but also building people’s capacities, improving health, redesigning services and addressing inequalities. Cities have been growing in confidence in spite of local government cuts. It is local government leaders who have been driving locality partnerships. Local leaders have increasingly demanded greater control over local finance and to lead strategies for housing, planning, waste, carbon capture, training, social care and health. The combined authorities have sought powers and freedoms for better governance, as well as financial settlements. The 2016 Devolution Act will come into place in April. The focus has now shifted from individual authorities and services to new ways of working across wider conurbations within the Core Cities group. It is intended that this will transform and integrate care, share utilities and socialise procurement through such initiatives as the West Yorkshire Procurement Forum. The Government is devolving £6 billion to Greater Manchester’s Health and Social Care strategy, which aims to deliver seamless and personal care across the conurbation. What is exciting is that there is a recognition that if this is to work staff must work in a seamless way, irrespective of place, service and professional boundaries. Public service innovation has been dogged by protocol and convention for years. Innovation has failed to become a reality because there has been little transformation of day-to-day operations or incentives for staff to innovate. Staff will now be allowed to dump the ‘rule book’ and focus on what people want. For the first time the top team are serious about reorganising for people. Two pilots are in place in Oldham and Tameside and the transition process has clout because it will be chaired by Sir Howard Bernstein. Smaller cities such as York, Swindon, Peterborough and Plymouth with tighter geography and creative leaderships have been working for some time on people-as-assets strategies to tackle social problems such as troubled families and are now ahead of the game in terms of utilising new technologies with local communities, the arts and universities in whole system redesigns. Universities are key to attracting and retaining youth – you only have to look to Plymouth, Bournemouth and Bolton. Running alongside the devolution process is the Smart Cities agenda, which encourages a whole system approach to utilising digital technologies. However, the market and growth of smart digital technologies needs to be harnessed to social and environmental ends: without the smarter local governance which the devolution agenda is driving, Smart Cities will fail to do more than increase the sales of apps. Devolution will continue to be a political battleground between those in the cities and the government, which views devolution as a solution to low productivity and slow business growth and as a way to end the block grant to local government. The government’s approach to devolution is shallow and relies on the ability of mayors to lead change, when the issue is not individual leadership, but the need for new forms of local governance and collaborative leadership. It is the assumptions that underpin devolution that matter. The way that it works is different in every place, but there are common themes and challenges – not least in making devolution deliver, especially on healthcare and training for young people. The leadership challenge is in driving a strong narrative for devolution which makes explicit the connections between devolution and public sector reform, through which devolved authorities are strong enough to argue for a fair financial settlement. Sceptics are suspicious that the Chancellor is adopting city devolution as a way of hiding the severity of local government cuts and of devolving not just budgets, but government responsibilities. Professor Parkinson and others have pointed out that devolved investment does not match the reduction in local government funding. Devolution can be pulled towards serving local interests, or it can be constrained by the government’s complacent free-market economics. The Core Cities Devolution agenda is more radical than that of the Government. Those outside the Core Cities say that most civil servants and MPs have not accepted devolution as a step change towards a new settlement with the cities and regions. An Institute for Government report argues that the government’s way of engaging with local leaders is poor, that Whitehall officials expect applications and bids to be submitted with little guidance within ridiculous timetables; that officials give little time for discussion; and that negotiations occur in a vacuum. One reason that people are watching Manchester’s health care strategy is that the local leadership is serious about throwing out the rule-book and allowing staff to innovate. If the government is watching this process, it is just possible it could lead not just to the devolution of power to city leaders, but also to those staff who actually deliver public services. 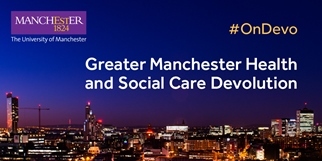 To mark Greater Manchester being handed control of its £6bn health and social care budget, we are running a series of blogs from leading commentators on what it really means for the region. Read more on Devolution issues. Su Maddock is Visiting Professor in Knowledge Exchange and Public Leadership, UWE, Bristol, and Hon Fellow, Manchester Institute of Innovation Research, The University of Manchester.